From microscopic vasectomy reversals in our Ambulatory Surgery Center to minimally invasive Greenlight Laser Surgery for Prostate Enlargement, the physicians and staff of Northeast Georgia Urological Associates have you covered. Serving Northeast Georgia for Over 30 years. Please click to go to new Website! In addition to performing common urological procedures, Dr. McHugh has a particular interest in the GreenLight Laser procedure for enlarged prostate, consultations for a second opinion regarding prostate cancer therapy, and performing microscopic vasectomy reversals in our ambulatory surgery center. Dr McHugh's book is in the top ten on Amazon's Kindle and in paperback books for the subject of prostate cancer. Over 200,000 times a year a patient will leave his urologist’s office having been told he has prostate cancer. What the patient thought to be a disease of old men from which they do not die, now presents a very complicated and frustrating dilemma about what treatment to pursue. The newly diagnosed prostate cancer patient does not need a definitive text book on prostate cancer; rather, he needs to know what is pertinent and specific to him in making a decision on how to treat it. The Decision offers the reader an insider’s view to the key issues necessary for a well thought out treatment plan that is unique to him. Drawing upon his experience in treating prostate cancer for over twenty years, as well as having been through the decision making and treatment process as patient himself uniquely qualifies Dr. McHugh as a mentor to the reader. 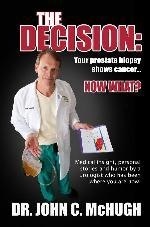 His book outlines a novel and multi-faceted approach to aid the newly diagnosed prostate cancer patient in making his “Decision.” Available in both book and Kindle formats at Amazon.com. Christie Woodruff R.N.,FNP-C life-long native of Gainesville, has over 30 years of a wide variety of medical experience. She is well versed in general medical practice. She has been instrumental in managing an ambulatory surgery center and is active in the White County community as the clinical director of Caring Hands Health Clinic in Cleveland, Ga. She is a welcomed addition to the Northeast Georgia Urological team. She has a particular interest in kidney stones and female voiding disorders to include recurrent urinary tract infections, incontinence, and interstitial cystitis. Christie has recently completed the Medtronic InterStim Neurostimulator certification in Minneapolis, MN. Her attention to the urologic needs of our female patients has been invaluable to our practice.